In the wake of the explosive growth of defined contribution (DC) plans invested with target date strategies, and the understanding of how important these strategies can be in effectively meeting retirement income goals, plan sponsors are seeking more optimal target date approaches. This timely book provides you with in-depth answers from the nation's most qualified and experienced experts to pressing questions about DC plan design. 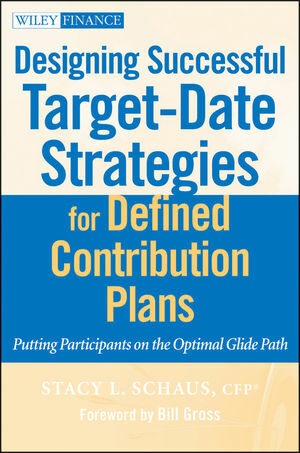 With a broad range of knowledge and insight, Designing Successful Target Date Strategies in Defined Contribution Plans helps you understand the evolution of DC plans, pulls together all angles of what it takes to develop custom target date strategies, and provides you with a look ahead to the future. STACY L. SCHAUS, CFP, is a senior vice president and the defined contribution practice leader at PIMCO, which manages over $130 billion in DC assets. Prior to joining PIMCO in 2006, she was a founder and president of Hewitt Financial Services LLC, where she created the Hewitt 401(k) Index. Ms. Schaus has nearly thirty years of investment experience. She has written extensively on defined contribution issues, including PIMCO DC Dialogue, and has been named by 401kWire as one of the fifty most influential leaders in defined contribution for 2010. Stacy is the Founding Chairperson of the Defined Contribution Institutional Investment Association, as well as a board and research committee member for the Employee Benefit Research Institute. She also is a former board member of the Financial Planning Association. PART ONE DC Plan Evolution and Design Trends. CHAPTER 1 DC Plans in the American Retirement System. Evolution of DB and DC Plans. Making the Move from a DB Plan to a DC Plan. How Do We Measure DC Plan Success? What Is a Qualified Default Investment Alternative? Auto-Escalation: How Much Is Enough? How Much Should We Save to Beat Inflation? Preparing for Retirement in an Economic Downturn. What the Future May Hold for DC Plans. CHAPTER 2 Evolving DC Plan Design. Investment Structure of Defined Contribution Plans. Future of DC Plan Investment Design. Tier I: Qualified Default Investment Alternatives—Asset-Allocation Strategies. Tier II: Core Investment Offerings in DC Plans. Tier III: Brokerage or Mutual Fund Window. Tier IV: Passive Investment Strategies? Evolving Structures and Alternative Investment Strategies. Bringing It All Together: DC Investment Structure and Guarantees. CHAPTER 3 Target-Date Strategies: Packaged versus Custom. Why Plan Sponsors Create Custom Target Retirement-Date Strategies. Intel: Building Is Better than Buying. Verizon: Well Worth the Effort. PART TWO Development of Custom Target-Date Retirement Strategies. CHAPTER 4 Legal and Fiduciary Considerations. Common Legal Questions Regarding DC Plans. Investment Policy Statements and Governance. Target-Date Strategies on the Hot Seat. What May Lie Ahead in Legislation of Target Strategies. CHAPTER 5 Record Keeping and Trust. Two Basic Approaches to Setting Up Record Keeping. Custom Target Strategies Lead to New Record-Keeping Approaches. Pros and Cons of Alternative Operational Approaches. Questions to Pose to Your Record Keeper. Key Considerations to Determine Which Approach to Choose. Conversion of Target Risk to Target Date. Deluxe Corporation: Seamless Operational Setup and Rollout Communication. How Record Keepers and Trustees Support Operations. CHAPTER 6 Communication Challenges and How to Meet Them. Common Myths Surrounding Custom Target-Strategy Communication. Communicating the Benefits of Target-Date Strategies. Communication: Strategies to Keep It Simple. Helping Plan Participants to Visualize Their Postretirement Future. Communications and the Switch to DC Custom Strategies. Communication Challenges during an Economic Downturn. CHAPTER 7 Evaluating Costs in Custom Strategies. Have You Calculated and Reduced Total Plan Cost? Unbundling Can Keep Down Costs. Custom Strategies and the Value of Unitizing. ERISA Section 404(c) and Fee Disclosure. Costs of Implementing and Running Custom Target Strategies. PART THREE Designing and Benchmarking Custom Target-Date Strategies. An Academic Look at Creating Optimal Asset-Allocation Strategies. A Practitioner’s Look at Creating Optimal Asset-Allocation Strategies. DC Plan Success Requires a New Approach. Evaluating the Probability of Meeting DC Retirement-Income Goals. Evaluating Risk-Factor Exposures in Target-Date Glide Paths. Plan Sponsor Approaches to Custom Target-Date Strategies. CHAPTER 9 Asset Classes and Alternatives. Clearing the Decks: Offering a Brokerage Window to Participants. Typical DC Core Investment Offerings. Adding Alternatives to Target-Date Strategies. CHAPTER 10 Helping Protect DC Assets from Risk. How Do We Experience Risk?. 2008 Market Impact on DC Participant Accounts. What Are the Main Types of Risk?. Helping Protect DC Participant Assets from Risks. CHAPTER 11 Approaches to Benchmarking. Introduction to Target Date Benchmarking and the Measure of Success. Common Approaches to Benchmarking Target-Date Strategies. PART FOUR Looking to the Future. CHAPTER 12 Financial Education, Advice, and Retirement Planning. Why Plan Sponsors Provide Education and Advice. Is Advice Needed When a Plan Has Auto-Enrollment and Target-Date Strategies? Education and Advice Offered by Plan Sponsors. Evolution from Education to Managed Accounts. Comparison of Managed Accounts and Custom Target-Date Strategies. CHAPTER 13 Retirement Income and Guarantees. Encourage Participants to Stay in the Plan or Go? Allowing Consolidation of Outside Assets into the Plan.